Last weekend our newspaper was dropped off at our house in the early hours of Sunday morning. The sun was sneaking out over the horizon, the birds were chirping, and the neighborhood was unbelievably quiet, making it the perfect time to try out my new slippers. I grabbed a light sweater and I walked out to the drive way in my PJs to grab it and pull out the comic books. As I bent over to pick up the wad of paper I glimpsed an add for the LA Book Festival this weekend and at moment my day was made. signs a couple of my books. I had an internship interview this morning, but as soon as it finished it wasn't long before we left for USC. We parked in the structure across from the dorms and walked towards the booths. It's at this point that I lacked words to describe how awesome it was. Books every, book lovers in every corner, and basically everything that's good in the world of reading was there. 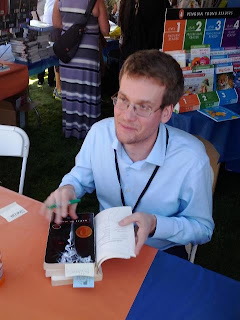 So, eventually, after we looked around for a bit and walked through the comic book booths for an unknown rather long period of time, we got in line to see John Green and get our books signed. Despite the long lines and the incessant heat, you can't help but have fun there. I did have to buy a book to get in line, but I figure that's a small price to pay to be within a 2 foot radius of his brain. Not only that, but I had a chance to meet new people and Nerdfighters while we waited in line, buy a couple books (I'll blog about that later), and meet my favorite author in the whole world. I'm quite proud of myself that I didn't freak out and fan girl when he was signing my books. It's awesome and a great experience. The campus is extremely pretty and the best place to hold an event like this. So if you ever have the chance to go to the LA Book Festival, just GO!